On their third full-length recording Immemorial, Chicago's Del Rey continues their journey into eclectic experimental rock. Immemorial is aneddy of swirling rhythms, angular melodies, and sonic disturbances that can both mesmerize and confound. Much of the material is purely art rock shoegaze that, with your eyes closed, could easily put you into a hyper-suggestive hypnotic state. And the suggestions to you would be 'you will like this' or roll a bone and pass it along. While the music roils and you reel, Immemorial's songs are more adventures in movements than consistent currents. Return of the Son of Fog Rider, E Pluribus Unicorn, or These Children that Come at You bend and maneuver like light through a prism on a rainy day. They'll develop in a stream of consciousness fashion only descend into sublime and then ascend into crescendo. Equally knotty and intriguing, Del Rey can capture your attention but then, after several songs, make you wonder where time went, and if you wasted it. 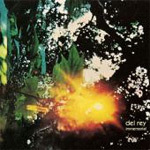 Call that a feeling that arises from Del Rey's nefarious ingenuity or mere experimental mischief, and you will discover the delightful conundrum that is instrumental art rock. Longtime fans and newcomers alike will find Del Rey's Immemorial challenging, but delightful extravagance. Longtime fans and newcomers alike will find Del Rey's Immemorial challenging, but delightful, extravagance of instrumental experimental rock.